The Best Way to Fill Billy Bookcase Holes - Lovely Etc. 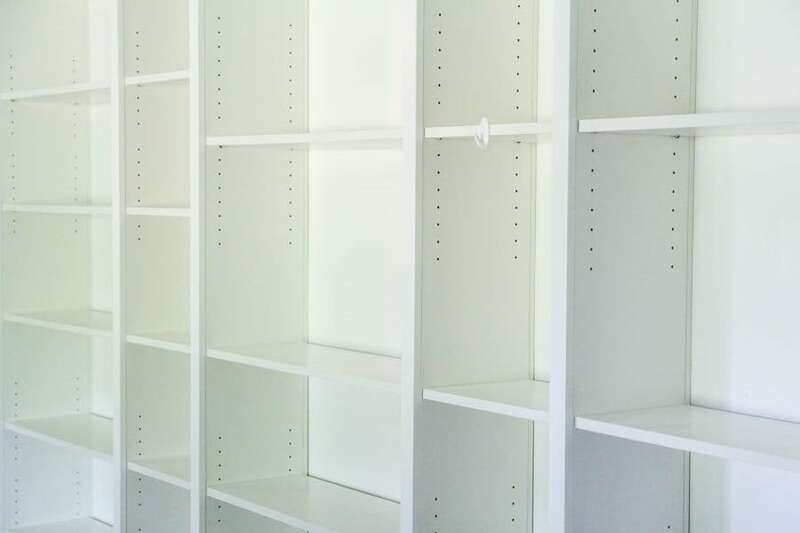 This is one of the easiest way to give simple IKEA Billy bookcases and other flat-pack bookcases and cabinets a major update. Filling in all of those shelf pin holes is an easy, inexpensive upgrade that makes a surprising difference if the look of the entire piece. A couple of months ago, I shared our big beautiful wall of built-in bookshelves made from IKEA Billy bookshelves. It’s a project I absolutely love and I am so glad I finally completed it. To make the Billy bookcases look like actual built-in wood bookcases I added trim, framed them with MDF, caulked, painted…it was definitely a long multi-step tutorial. And buried in that long tutorial was a tip that can make any inexpensive flat-pack bookcase look a hundred times nicer even if you aren’t interested in adding trim and doing all the things. So I decided to share that fantastic tip again for everyone who would love to give their IKEA bookcases a quick update in less than an hour without needing a single power tool. And I’m also going to work on sharing more quick tips like this – there are so many small but important DIY tips and tricks that end up getting buried in long DIY tutorials. So be on the lookout for more quick DIY tricks that will make your next project 10 times easier. One of the great things about IKEA bookcases and other inexpensive bookcases is that you can adjust the shelves to any height you want. Sometimes, even expensive solid wood bookcases have these holes so that the shelves can be fully adjustable. Unfortunately, the downside is the rows of tiny holes that line the insides of the bookcases. As handy as they are, I really don’t like the way they look and when I was putting together my wall of built-in IKEA bookcases, the holes really seemed to cheapen the entire piece. They were the one detail that stuck out like a sore thumb. So I did a bit of research and a bit of experimenting and found a very easy way to make those bookshelf holes disappear. IKEA actually sells little plastic plugs that you can stick in to plug the holes. Unfortunately, these plugs are designed for plugging holes in their kitchen cabinets and not necessarily for bookcases. I haven’t personally tried these because the nearest IKEA is three hours away. 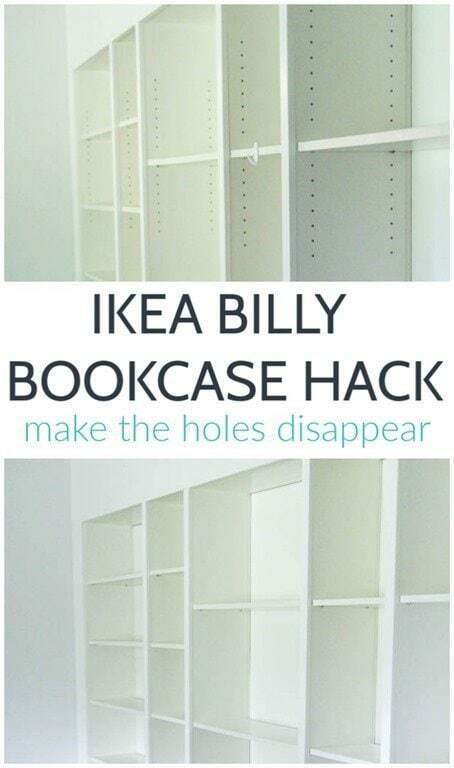 However, I did find reviewers who shared that they fit the holes in older IKEA Billy bookcases, but not ones sold in the past five years. They also don’t sit exactly flush with the sides of the bookcase, but have a slight dome to them. So even though those would be a very quick option, they weren’t for me. Thankfully I found the perfect solution – basic spackling. 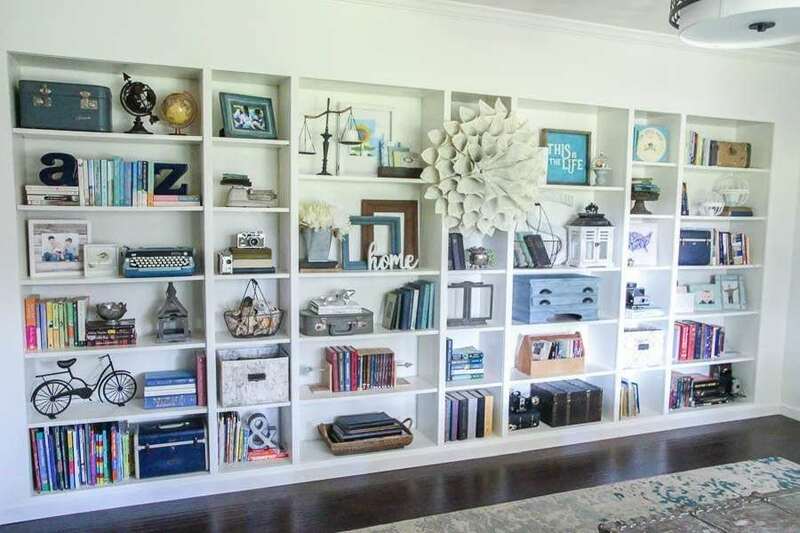 Spackling is very inexpensive, it is easy to apply, and it dries to a white that very closely matches most white bookcases. Plus, it is not difficult to remove. 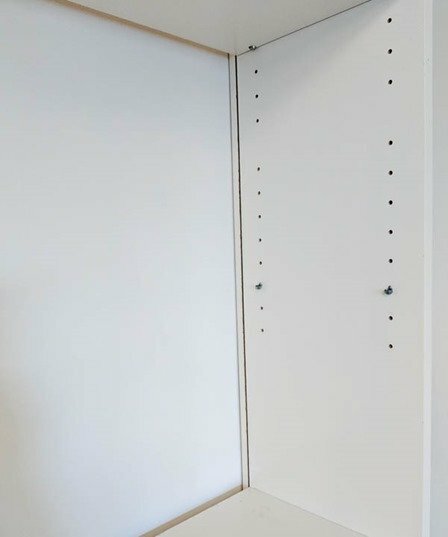 If you decided you want to rearrange your shelves in the future, it is very simple to poke the spackling out with a screwdriver and stick a shelf pin in the hole. Before beginning the spackling process, decide exactly how you want to arrange your shelves. Remove the shelf boards to give yourself room to work, but leave the shelf pins in the holes you plan to use for your shelves. 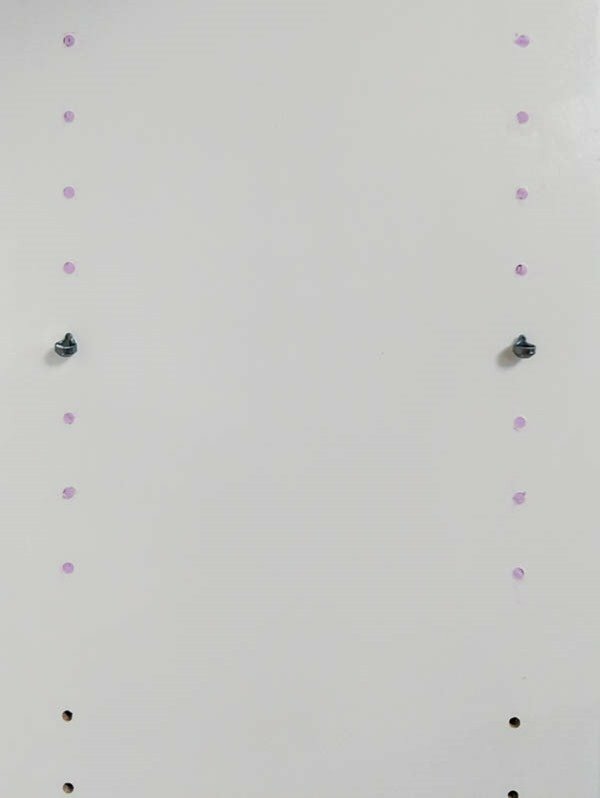 You definitely don’t want to accidentally fill the holes you need! I had seven bookcases and hundreds of holes to fill so I refined my process as I worked through them. 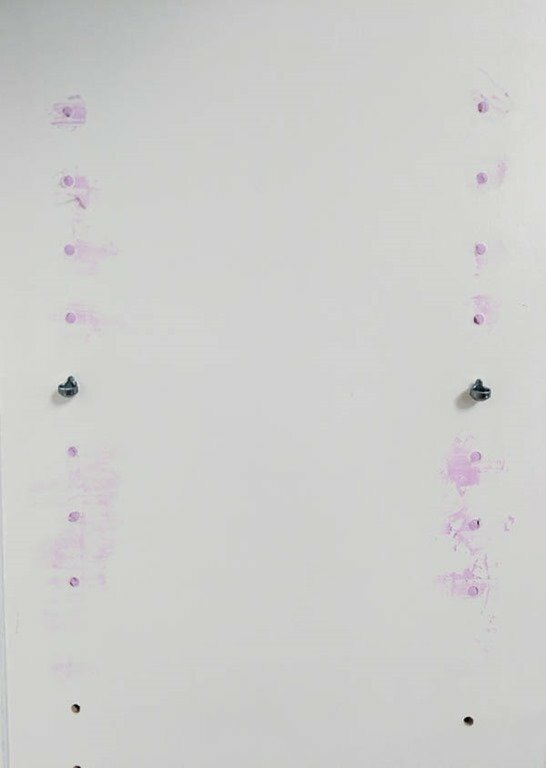 I started out applying the spackling with a plastic putty knife, but eventually I found that it was much faster to simply rub some into each hole using my finger. Once you have applied spackling to each hole in one section, wipe off any excess with a slightly damp paper towel or with your finger. Allow the spackling to dry fully. As you can see, I always prefer to use DAP Drydex Dry Time Indicator spackling. It is pink when you apply it and turns white when it is fully dry. I tend to get impatient to move on to the next step when doing projects and this keeps me from jumping ahead too quickly. This picture was taken when I first started. You can see that I hadn’t yet figured out that it is much easier to wipe off the excess spackling before allowing it to dry. From left to right: freshly applied spackling, mostly dried spackling, and smoothed spackling. Once it is dry, you don’t even have to sand it. Since you already removed most of the excess spackling, just gently rub a damp paper towel over the spackling to wipe away any rogue spots. 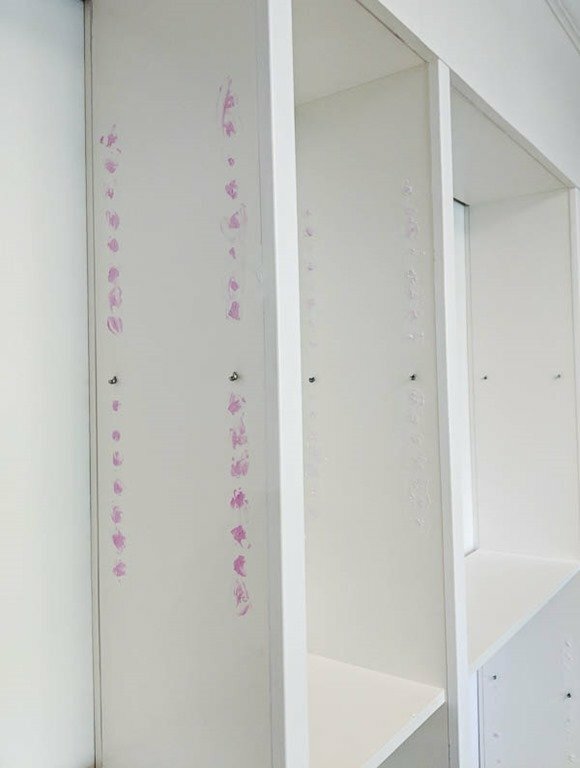 Since IKEA Billy bookcases are laminate and non-porous, the spackling doesn’t stick well to it and any excess easily wipes away. The spackled holes will blend in beautifully with the white bookcases. 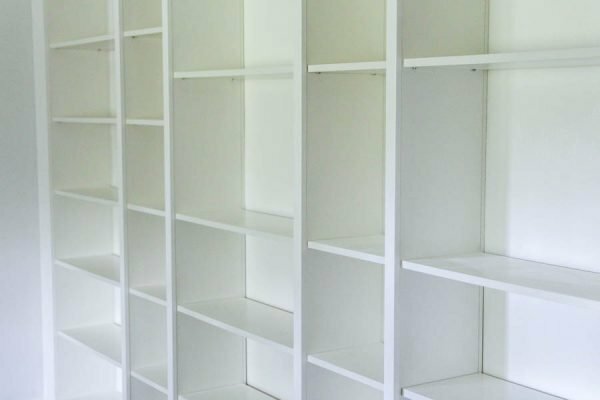 This solution worked beautifully for me because my bookcases are white and so is the spackling, but what if your bookcases aren’t? If you are planning to paint your bookcases anyway, simply spackling before painting. If your bookcases are already painted a color other than white, find the paint swatch that most closely matches your bookcases and use a sample of that paint to paint over just the white spackling circles to make it blend. And if your bookcases are wood color, you can either find a paint that is a similar color to the wood to paint over just the tiny spackled holes, or you can find wood look hole plugs online – just be sure to measure first so you get the right size for the your bookshelf holes. Such a quick and easy update and it truly makes such a difference! and if you’re feeling inspired to maybe go even further, you have got to check out my IKEA built-ins tutorial. I really worked to make sure each step was simple and clear. And they turned out beautifully! Yay, I am glad it helped!